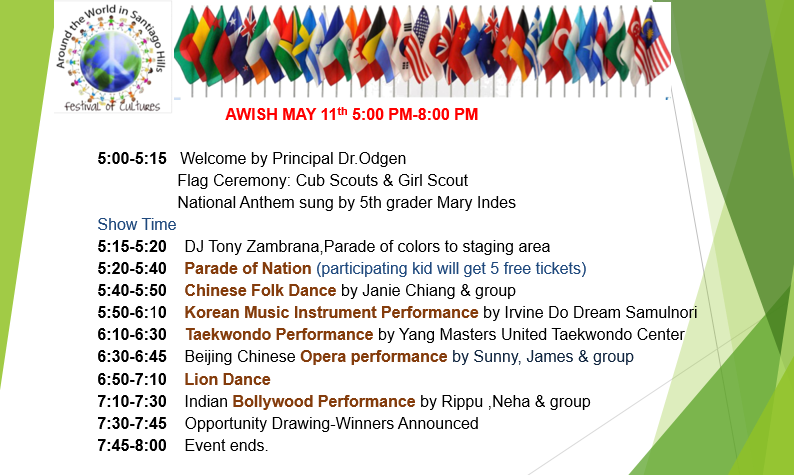 Friday, May 11, 2018 from 5:00 – 8:00 p.m.
Around the World In Santiago Hills (AWISH) is our annual PTA cultural festival celebrating the great diversity we have at our school. AWISH features countries from around the world with fabulous food, fun, activities, music, and entertainment. This wonderful event is supported by the PTA, teachers, parents, local communities, and students. We have parents and teachers hosting country booths. Our local community sponsors will also be hosting craft and activity booths. Local Assisteens will be helping with country booths, carnival booths, face painting, and balloon art. Spend the evening with family and friends, trying food from different countries, enjoying cultural performances, and having fun with family and friends. Host a food or craft booth. It’s not too late to turn in your applications. Our deadline for all application is 04/25/18. Click here for application forms. Have your kids participate in Parade of Nations by wearing traditional outfits. Kids will get 5 FREE tickets to participate in Parade of Nation. Donate some baked good for Bake-walk on the day of AWISH. 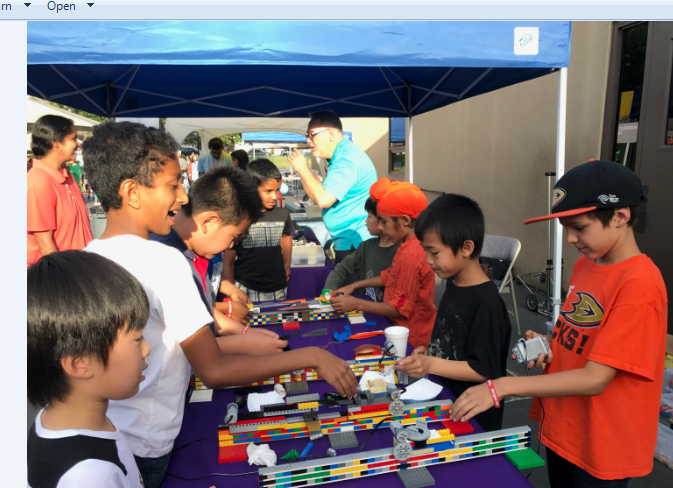 AWISH is featuring lots of activities including Bouncy House, Carnival games, International Cultural performances, Firefighter truck, Police car, activities including Martial Arts booth, Lego booth and much more. 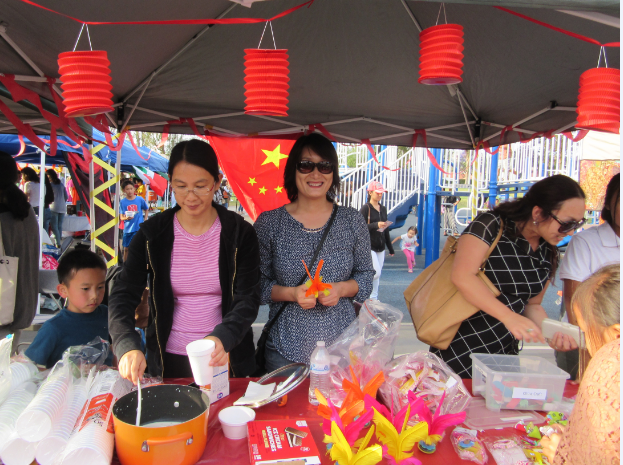 China Booth serving up delicious food and offering some traditional games to play. 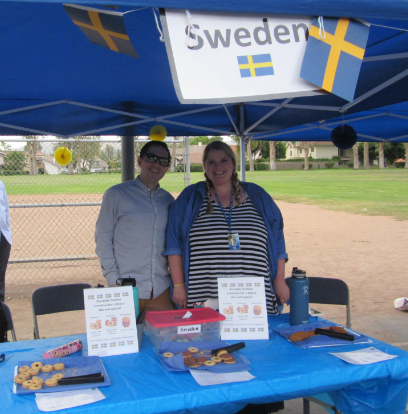 Team Pellet representing Sweden, offering a variety of sweets! 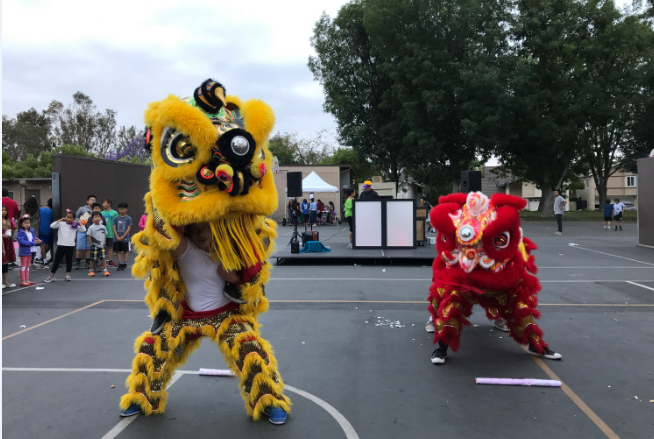 Lion Dance showing some great moves. Represent a country at AWISH! Do you have a country you’d like to represent? Please sign up to share your culture with us through food or an activity. Booths can be run by several people, so you don’t have to do it alone. The PTA will also reimburse you up to $250 for the cost of running the booth. AWISH features countries from around the world with fabulous food, fun, activities, music, and entertainment. It is our annual celebration of the many heritages and backgrounds that make up our school and community. HOST A COUNTRY BY FOOD OR CRAFT BOOTH.Y ou can represent any country. Booths can be run by several people, so you don’t have to do it alone. The PTA will reimburse you up to $250 for the cost of running the booth. Have your child participate in the Parade of Colors! Children come in the costume of their country to participate. If you would like to bake something and donate it to the Bake Walk Activity, all you need to do is make your item, package it and send it in on the morning of the event with the Bake Walk Donation Form also found on the PTA Website. New for 2018: Get 5 free tickets for participating in the Parade of Colors! You can also contact Snigdha Mandloi at awish@santiagohillspta.com to sign up, have your questions answered, or to find out the dates for future meetings. You can also visit our AWISH page for additional information. If you can’t run a booth but would still like to be involved, please come to the meeting to find out how you can help!